(20760.3, Oklahoma Historical Society Photograph Collection, OHS). Located on State Highway 125 in the eastern portion of Craig County, Bluejacket is approximately seventeen miles north and east of Vinita. In 1871 the Missouri, Kansas and Texas Railway established Bluejacket Station as construction pushed south through the Cherokee Nation from the Kansas border toward Texas. The site was named for Rev. Charles Bluejacket, chief of the Eastern Shawnee, who lived nearby. In 1882 the Post Office Department approved a post office, with Chief Bluejacket as the first postmaster. Bluejacket was incorporated in 1894. Agriculture provided the area's main income. During the early twentieth century principal businesses included a broom factory, a grain elevator, the Craig County Weekly Gazette, the Bluejacket News, and the Bluejacket Gazette, two banks, and a variety of other enterprises. Bluejacket's 1900 population of 303 climbed to 508 in 1910. In 1938 and 1939 major tornadoes destroyed much of the business district. The first struck on May 4, 1938, arriving from the northeast instead of the usual southwest. The storm killed a farmer and destroyed a number of barns and livestock. The second tornado descended on Craig County on August 24, 1939, cutting a ten-mile-wide path from south to north. The Bluejacket area took the brunt of the storm, which demolished three businesses and damaged all other establishments, as well as most houses in the town, injured dozens of people, killed many horses and cows, and reoriented the railroad depot ninety degrees from it original position. Large hailstones slaughtered hundreds of chickens. Two young men died in the storm. The county's total property damage approached one-half million dollars. The 1940 population stood at 349 and fell to 234 by 1970. The remaining business district was slowly abandoned, and the last old building was demolished in 2003. At the beginning of the twenty-first century Bluejacket had a convenience store, a post office, and a volunteer fire department building. Bluejacket High School served 250 students in grades kindergarten through twelve. Improvements to the facility included a new gym built in the early 1970s and a new high school building constructed in the early 1990s. Other businesses included two nursing homes, three churches, a laundry, and a car wash. Most residents commuted to work in Vinita, Miami, or other area towns. Owen Cash, founder of the Society for the Preservation and Encouragement of Barber Shop Quartet Singing in America (SPEBSQSA), was a Bluejacket native. The 2000 census registered a population of 274, and the 2010 census found 339. Vinita (Oklahoma) Daily Journal, 4 May 1938 and 25 August 1939. 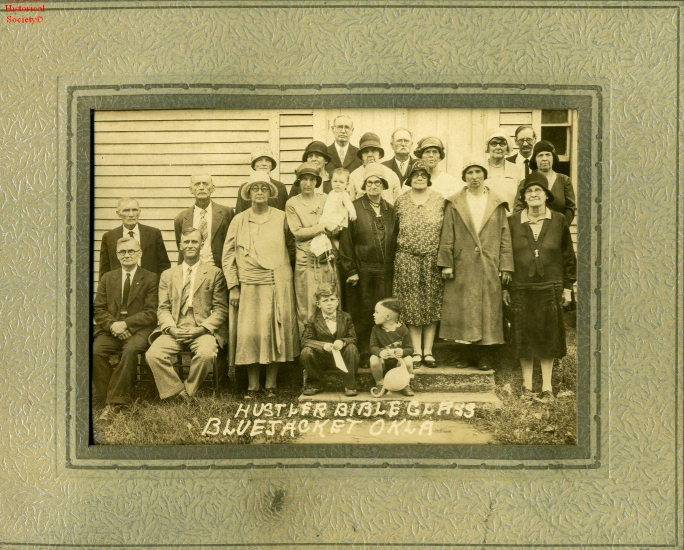 Craig County Genealogical Society, "Bluejacket," The Encyclopedia of Oklahoma History and Culture, https://www.okhistory.org/publications/enc/entry.php?entry=BL015.